We Southern Baptists are a Great Commission people. It’s in our denominational blood! As we come into the state convention season of SBC life, we will undoubtedly be challenged again and again to share the gospel, sHaRe tHe gOsPeL, SHARE THE GOSPEL! Indeed, I welcome that clarion call from Scripture because it captures the heart of God and needs to be sounded again and again, but the Bible doesn’t simply tell us to share the gospel. It also gives us principles for how to share the gospel. One of the richest places to gain some vital principles for sharing the gospel comes from Acts 16. There were find the history of Paul preaching the gospel in Asia Minor and Europe on his second missionary journey, which led him to a seller of purple named Lydia. Five principles of evangelism jump out to me there in vv. 1-15 as Paul is heading for a divine appointment with this lady. 1. Team up with gospel partners. Therefore, Paul was looking for a gospel partner and found one in Timothy, who was willing to go with him (Acts 16:3). Friends, I’m not saying to keep your mouth shut if you don’t have a gospel partner there with you when you are out and about, but as a general rule, when we plan to go out witnessing, we should have a gospel partner with us for protection, companionship, encouragement, and accountability. 2. Be willing to contextualize for the sake of the gospel. What we read there at the end of Acts 16:3 is a bit radical: Paul wanted [Timothy] to go with him; and he took him and circumcised him because of the Jews who were in those parts, for they all knew that his father was a Greek. Here’s a grown man being circumcised! I imagine that procedure was rather painful, but Paul called for Timothy’s circumcision, and Timothy agreed because they didn’t want Timothy’s uncircumcision to be a stumbling block for the Jews in the areas they would be going into. Paul had his ministry context in mind. That’s what contextualizaton is—keeping in mind the cultural context that we will be delivering the gospel into so that it will be most easily understood and received. You and I should do the same thing as well. Just last month I had the privilege of leading a missions team to southern Ohio, which is about six hours from where we live in Tennessee, to work with an established church and three church plants. Particularly with that established church, which is a small church in Appalachian Ohio, I wanted to make sure that as we were going into a new context, we wouldn’t shoot ourselves in the foot by offending people with our outward appearance. The gospel is offensive enough! So, one of the questions I asked the pastor of the church was, “Is it alright if our women wear pants when we minister with you?” Why did I ask that? I asked that because there are segments of the Christian church that see women wearing pants as offensive, and I wanted to remove as much person to person offense as possible, leaving the gospel as the only offense. For the sake of the gospel, you and I must be willing to keep the cultural context that we will be evangelizing in in mind, and sometimes that calls for drastic measures, as Paul and Timothy demonstrate. 3. Spread the gospel far and wide, but be tender to the Holy Spirit’s leading. We see something there in Acts 16 that is absolutely shocking. Paul and Timothy began traveling through Asia Minor, sharing the gospel and delivering the decision of the Jerusalem Council in Acts 15, but there are certain points along the way where the Holy Spirit forbade them to speak. What?! Aren’t we supposed to share the gospel everywhere we go? Well, yes, we are to share the gospel far and wide, but we also must be tender to the Holy Spirit’s leading. 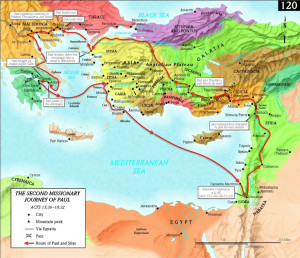 We see in v6 that they simply passed through the Phrygian and Galatian region, and the text tells us they did so “having been forbidden by the Holy Spirit to speak the word in Asia,” which was what the western-most region of Asia Minor was called then. 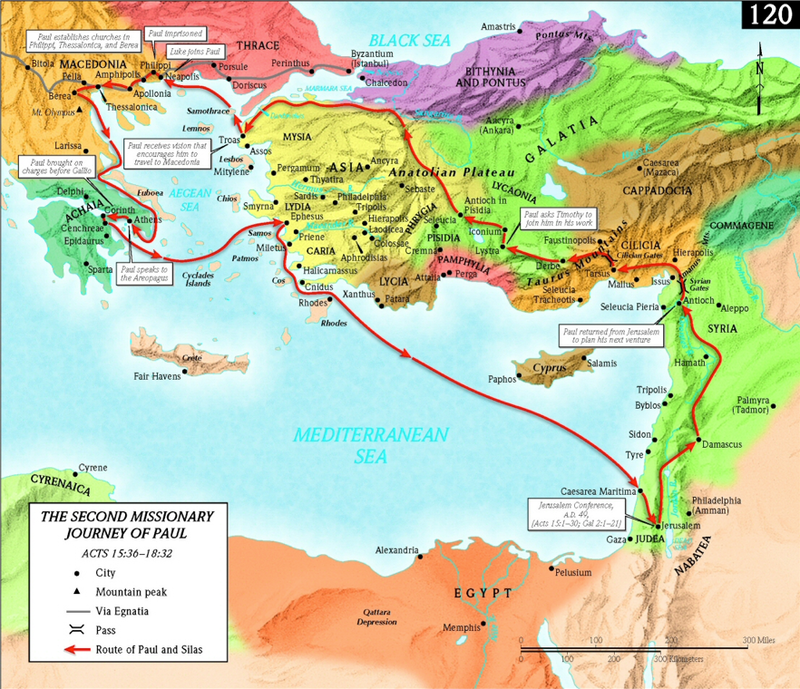 After that, we see in v7 that Paul and Timothy tried to go into the region of Bythinia, which is the northern-most province of Asia Minor, but “the Spirit of Jesus did not permit them.” So, they eventually ended up in the city of Troas, which is in western Asia Minor on the coast of the Aegean Sea. It’s there that Paul while sleeping receives a vision from God to go to Europe, namely the region of Macedonia. There Paul eventually ended up in the city of Philippi, where he would meet the seller of purple. What a shocking thing it is to think about God the Holy Spirit forbidding Paul to share the gospel in the regions of Phrygia, Galatia , Asia, and Bythinia! I mean, don’t the people in these regions need to hear the gospel too? Well, yes, but we see here that God was sending Paul to a divine appointment with the seller of purple. God desired to save Lydia and needed Paul to get there ASAP. Paul tried to share the gospel far and wide as he went, but the Holy Spirit was leading Paul and Timothy to Lydia, and he was tender to follow. You and I should always be as well. 4. Remember that salvation is a supernatural work. Once Paul and Timothy arrive in Philippi, they eventually ended up by a river where they hoped to find a prayer meeting. Indeed, they found one, but instead of praying, they began talking about Jesus to the women who had assembled. One of those women was Lydia, a seller of purple fabrics, and she soon trusted Christ as her savior. However, we have to take notice of what the Scripture says. In Acts 16:14, we read about Lydia, “…and the Lord opened her heart to respond to the things spoken by Paul.” The language here suggests that if God had not done something in Lydia, namely open her heart, she would not have responded to the gospel Paul was sharing, which leads me to conclude that salvation is a supernatural work. God must do something more than He has already done in creation and the cross if anybody is going to be saved! He must open the heart of individuals so that they can be saved. Salvation is indeed a supernatural work, which means that you and I should not just share the gospel. We should also pray to God as we share the gospel. We should pray for Him to give us hearers, convict the hearers, and then supernaturally open the hearts of the hearers so that they can believe. Don’t ever forget this! 5. Aim immediately with the gospel at those close to the one whom the Lord just saved. God opened Lydia’s heart and saved her, but Paul didn’t stop there. He immediately turned to her family with the gospel, and we read in Acts 16:15 that not only did Lydia end up being baptized, but her entire household as well. Her entire household trusted Christ as their Savior! When we win somebody to the Lord Jesus Christ, the folks closest to the new convert are positioned to be the most impacted—their spouse, children, parents, extended family, friends. They know this person, love this person, and respect this person. Undoubtedly, their loved one’s conversion will weigh heavy upon them, influencing them to trust Jesus as well. These are the one’s whom we should try to win next. Like a chain reaction, I’ve seen instances where God saved an entire family. When the first one comes to Christ, we must immediately to their close connections to see who might be next. I’m so thankful that God sent Paul all the way from Lystra to Philippi to bring the gospel so that this entire family would be saved. May we follow these simple principles and see a great harvest ourselves!